We all enter into romantic relationships with expectations. Expectations that we are going to be cared for, adored, loved, fulfilled, or even hurt or betrayed. Based on our life experiences and relationship ideals, these expectations can vary greatly. If your expectations for your partner fall into the realm of too high or too low, it can be damaging to your relationship. For example, if you expect your partner to complete you, pay for everything, or treat you “like a queen”, there is a high chance of disappointment and unhappiness. Your expectations may be too low if you feel you are settling, don’t care, or assume your partner is going to hurt you (emotionally or physically) without reason. In both scenarios, it is important to acknowledge that these are unrealistic expectations and have a conversation with your partner. Setting realistic expectations in your relationship will ultimately bring you more stability and happiness in your relationships moving forward rather than constant disappointment. 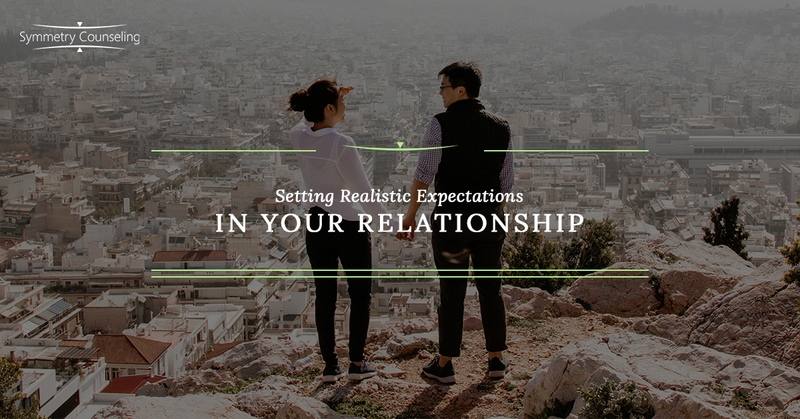 Below are a few ways in which you can begin to set realistic expectations in your relationship. While being aware of what you are looking for in a partner or spouse is important on your journey to find them, it can be detrimental to look for perfection. The danger occurs when you have ideals of your prince charming, dream wedding, or perfect girl, and your expectations may never be met. There is always going to be a flaw of sorts (arguments, disagreements, disappointments, etc). Recognizing your expectations for another human being to meet every need, complete you, or be perfect helps you bring your expectations closer to reality. When your expectations are too low, you run the risk of settling. Those who have low expectations of relationships tend to have low self-esteem, feel everybody is going to hurt them, lack trust, and tend to not use their voice. If you are currently experiencing this in your relationship, it is important to reflect on past relationship experiences. Is there evidence that this person is going to betray or hurt you? Is this residue from a past relationship? If you are not happy in your relationship, begin using your voice. If you are happy and are assuming the worst, try giving them a real chance. As you have reflected on your expectations and determined if they fall in the “too high” or “too low” range, it is important to have a conversation with your partner. Healthy relationships require constant communication regarding the expectations each partner brings to the relationship. This means that your partner does not always know your needs and wants are and you have to speak up. In these conversations, you are able to establish boundaries, compromise, and gain clarity about each other’s needs in the relationship. Once you have thought through these and understand yourself and your partner, it is important to practice being mindful moving forward. Are you getting angry when they didn’t do what you wanted? Did you expect too much? Continue to engage in self-reflection and communicate with your partner regularly. Doing this will help you both have realistic expectations moving forward and give each other the chance to meet them. If you have unrealistic expectations in your relationships and would like some guidance, it may be useful to connect with a therapist. Contact Symmetry Counseling at 312-578-9990 to set up an appointment with one of our very skilled therapists today!